Digital radiology needs to be more of a social medium—fortunately, not in the sense of radiologists posting selfies to Facebook and Instagram, or tweeting where they're having lunch. The relevant challenge is using technology's tools to communicate with others in the health care system in a more useful way than just pushing data, in the form of images and reports, from place to place. Communication and collaboration are the great values social media technology can bring. That idea is a key point in David Yeager's feature on integrating RIS with PACS and/or EMRs, "Epic Change?" on page 20. As EMRs expand their reach in hospitals, it makes sense that EMR vendors would develop their own RIS to integrate smoothly with their products. Epic's RIS is replacing older information systems in many hospitals implementing electronic records. While that approach works for those who primarily interact with these systems from the EMR access point, tightly integrated PACS and RIS have a track record of working from the radiology workflow perspective. In the big picture, it appears that the perspective of those outside radiology is winning. "The current reality is that RIS/EMR integration works," said David Avrin, MD, PhD, a radiology professor and vice chair of radiology informatics at the University of California, San Francisco School of Medicine, who was interviewed for this article. "We need better tools and vendor agreement to make interoperability easy," Avrin adds, "but you can make a stronger case for the RIS/EMR argument than you can for RIS/PACS." Tessa S. Cook, MD, PhD, an assistant professor of radiology and the chief of 3D and advanced imaging at the Hospital of the University of Pennsylvania, thinks the RIS/PACS vs RIS/EMR debate might obscure the point of what facilities and their users really need: better collaboration. "I think, in the best case scenario, [we should] try to determine the technologies that make the images widely available, allowing the referring providers the opportunity to interact with the images, but also allowing radiologists, in a consultative environment, to interact with the providers, perhaps manipulating the data on one side [of the interface] so that the providers can see it on the other side, and actually have continuing consultation about patients," Cook told Yeager. Technology should facilitate that collaboration, incorporating some social media–like aspects. That collaboration also represents a considerable chunk of what many call value-based radiology. How to do that is a far more important goal than the intermediate step of answering the RIS/PACS/EMR question. 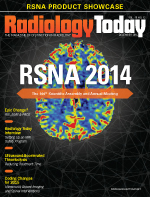 Enjoy the issue and RSNA 2014.